This Basement Subfloor Interlocking Tile is great for use under regular carpet, carpet squares, vinyl planks or other laminate flooring. 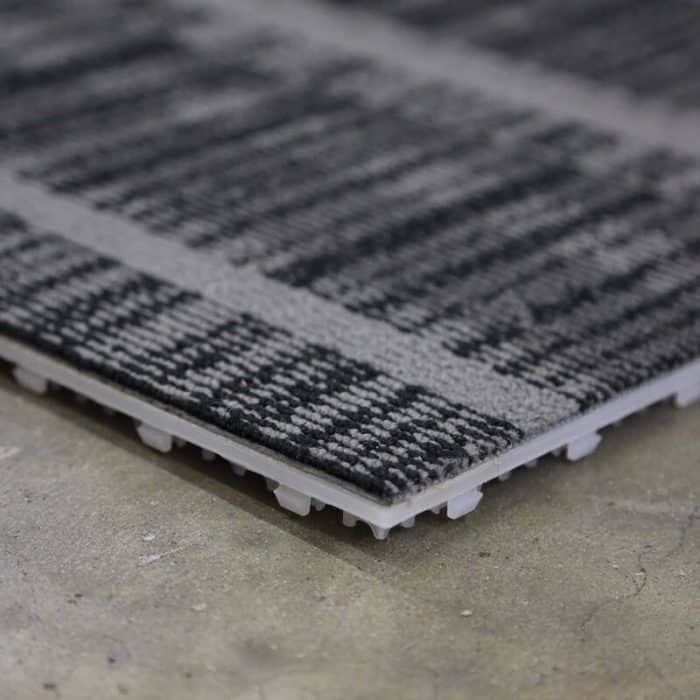 They are designed to to form a thermal barrier below your surface floor. The DIY Basement Subfloor Interlocking Tiles are great for use under vinyl planks or other laminate flooring. Manufactured in the USA, the Basement Subfloor Tile is designed to create a floating underlayment base providing a barrier separating the concrete and the finished floor. 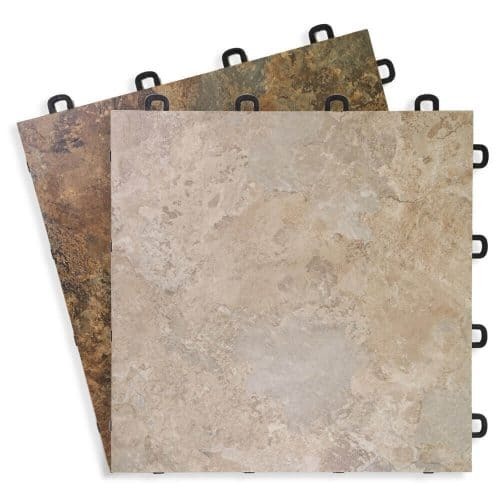 Intended to be used in residential basements, this tile subfloor protects wood planks or other engineered flooring from potential moisture damage. They also create a thermal barrier when installed as underlayment for a finished basement floor. Due to the smooth surface of the basement underlayment tile, any flooring placed over it will lay flat. 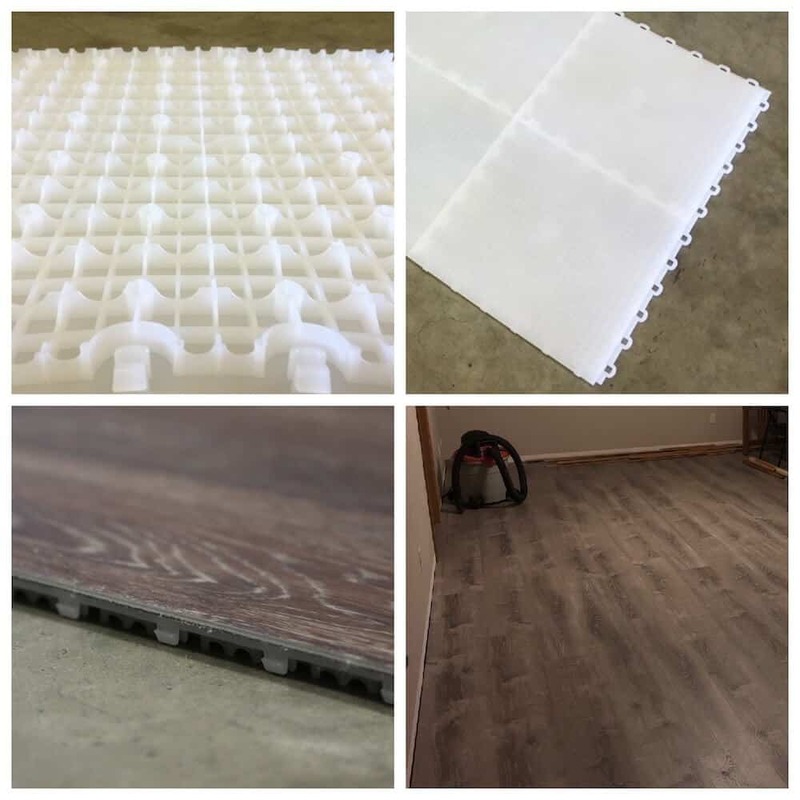 Manufactured with specially formulated flexible polymer, the basement subfloor Tile can support large amounts of weight in your basement (i.e., sofas, cabinets, pool tables, etc.). 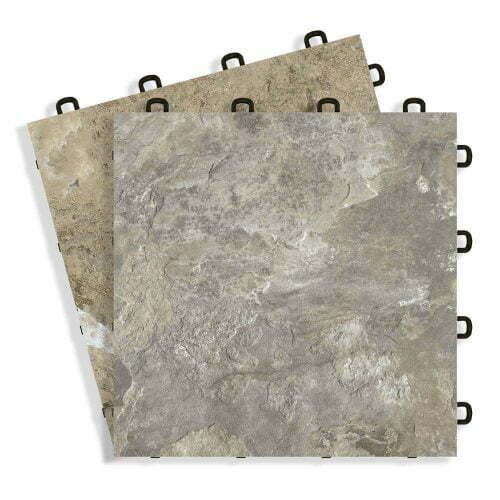 However, because of its flexibility, this subfloor tile can conform to slightly uneven surfaces. The floor of your basement is typically the lowest surface in your home. Humid air is heavy and will settle to the lowest level of your house. As a result, you will need to be mindful of the effect of moisture and humidity on your basement flooring. There are many options for a finished basement floor. The best options will seal your basement from moisture and condensation. Our basement subfloor system can be used with prevent moisture-related issues and provide a smooth, level surface so that you can top the subfloor with your choice of flooring. If you are interested in carpeting, you will want to consider installing it over plywood and with padding. Carpet is also sold as carpet tiles that are made with pads and self-adhesive backing. Vinyl flooring is another alternative that can be used with our subfloor system. 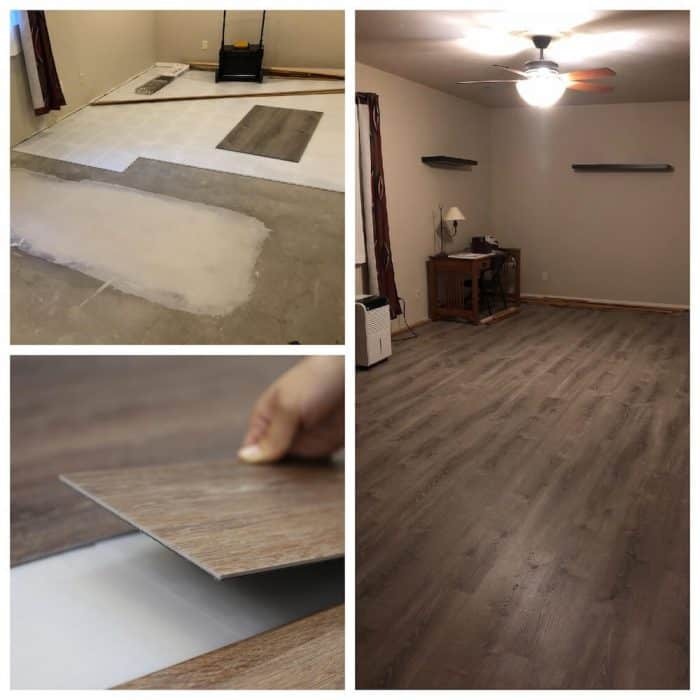 It comes in rolls or self-sticking vinyl tiles that can be installed easily to plywood and placed over our subfloor underlayment tiles. Engineered hardwood planks and laminate flooring can also be used over our basement subfloor tiles. 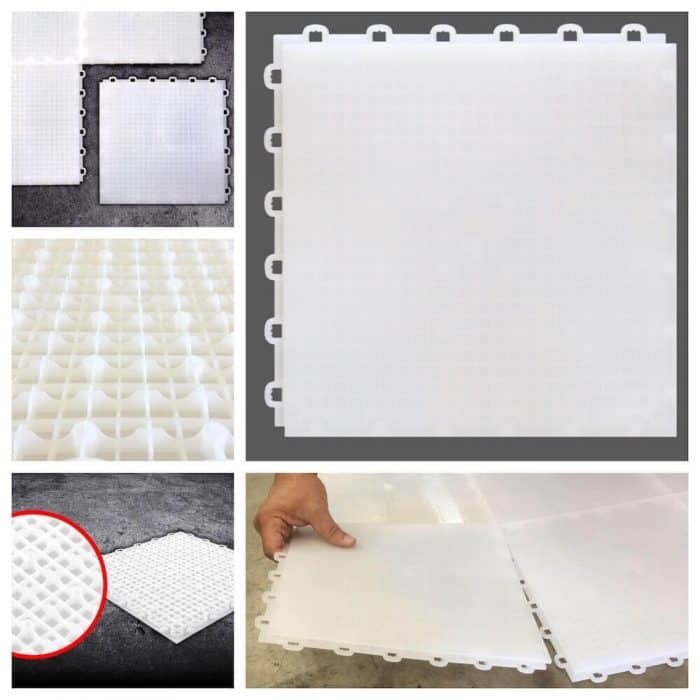 They can float over a layer of thin foam sheeting or rubber underlayment. It is possible to glue flooring directly to our tiles; however, we do not recommend this as gluing with a floating floor is a very tricky process. Customers may over glue which will be problematic for the tiles because they expand and contract with changes in temperature over time. Instead, you can glue the floor to a plywood underlayment that will rest on top of the basement subfloor system. When the muggy warmth of the humidity in your basement comes in contact with the concrete floor (which is a naturally cooler surface), the difference in temperature plus the moist air can cause condensation on top of the concrete floor. Inevitably, this would cause mold and mildew to develop on flooring placed on top of the concrete. The sole purpose of the basement subfloor tile is to protect your finished floor from such moisture problems. The materials used to create this tile form a mold resisting barrier between the concrete floor and the finished floor. The grid structure underneath the subfloor tile keeps the humidity from contacting your finished floor. 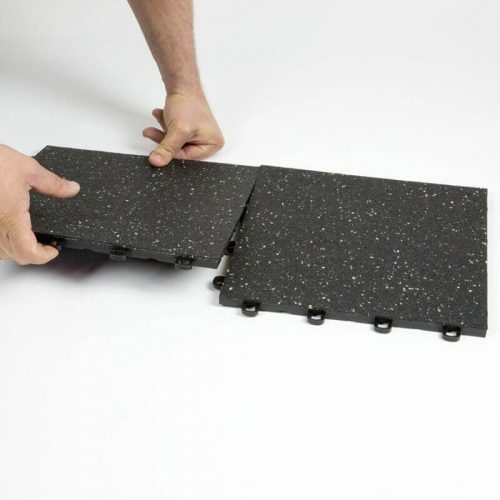 Unlike the other interlocking tiles, the basement subfloor system is made with flap features along the same sides as the loops to block moisture providing an additional “sealed” quality. The Six Loop-to-Peg Interlocking System along with the light weight of the basement subfloor system make installation simple. 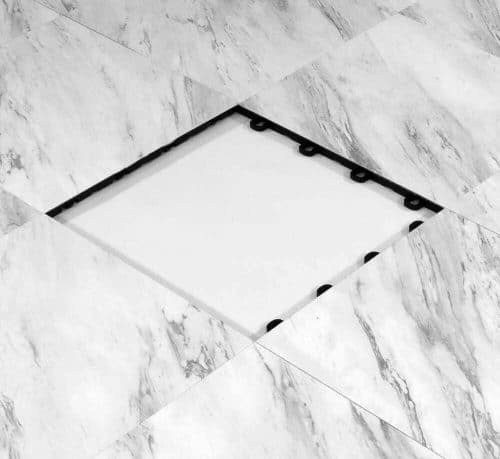 This Interlocking System allows each basement subfloor tile to snap together like a puzzle. Tools are hardly necessary because the tiles can interlock with a single downward push. In cases of flooding or water damage, the basement subfloor system can be easily disassembled. As another benefit to its lightweight and interlocking system, the DIY basement subfloor is portable and can be taken with you if you move to a new home. TIP: Although tools are not needed to install your subfloor, a plastic mallet and knee pads may be used to further ease your installation process. First, calculate the number of cases you need for your project. This is normally very simple because you just need to know the square footage of your basement. You will need to consider whether you will be cutting the tiles to go around any permanent structures or accommodate a uniquely shaped space. If you will need to cut the flooring to install it around any permanent structures, you will need to add about 6% to the square footage for the total number of tiles needed. These additional tiles will cover the waste amount that will be used. If you need help with the calculation, you can contact us, and we will be happy to help you. Next, prepare the area by removing foreign objects, dirt and debris so that you are beginning with a clean concrete base so that the tiles will lay flat. These subfloor tiles require a flat base (though some unevenness is okay). If you need to cut the tiles, please use a jig-saw with a fine-tooth blade (plastic blade). When using an electric blade, make sure you use protective glasses and take any safety precautions recommended by the owner’s manual for the tools used. You will need to leave at least a 1/4-inch of space between the tiles and walls or permanent structures because the tiles may expand and contract with temperature fluctuations. 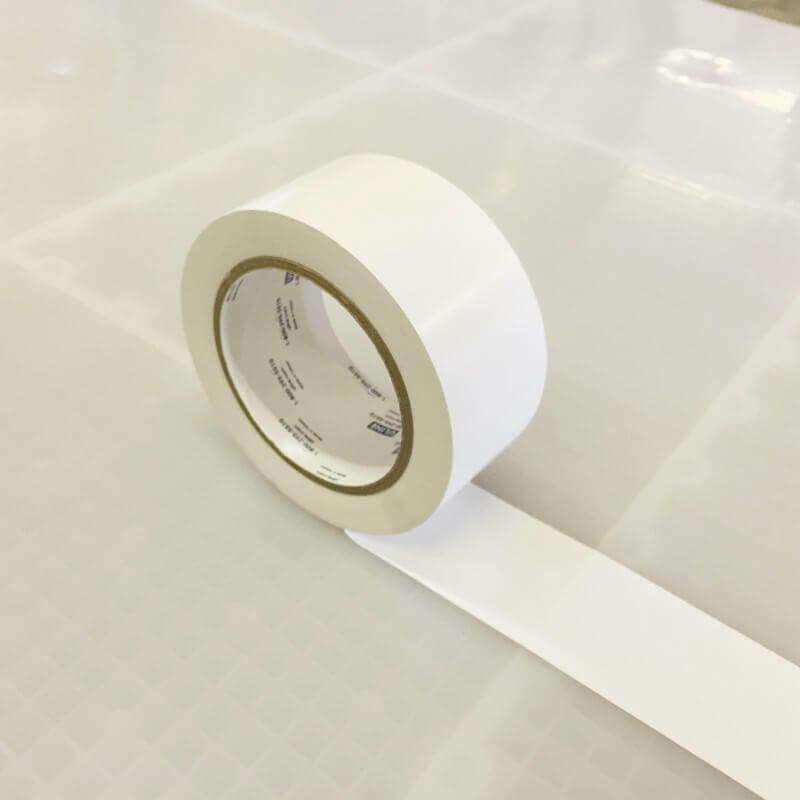 Vinyl Tape is recommended when there is excessive moisture. It will provide an additional “sealed” feature to your subfloor for protection from humidity. TIP: Flaps at the end that overlay on the next tile make a “seal” that eliminates the gap that regular interlocking basement floor tiles have. This protects the floor that goes over the subfloor tiles. Special vinyl tape can be used to seal it further if required. Subfloor underlayment tiles from Modutile and Vinyl planks over the underlayment. I have used two different underlayment over concrete in the past and modutile is the better product. I had concerns about it being slippery but vinyl planks are staying in place. I plan to do same for other rooms in the basement. Just an amazing product. 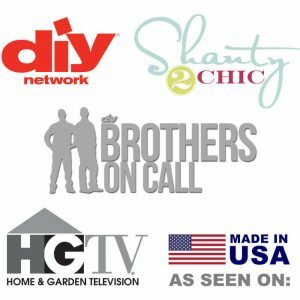 So easy to install and easy to cut. I’ll attach some pictures..